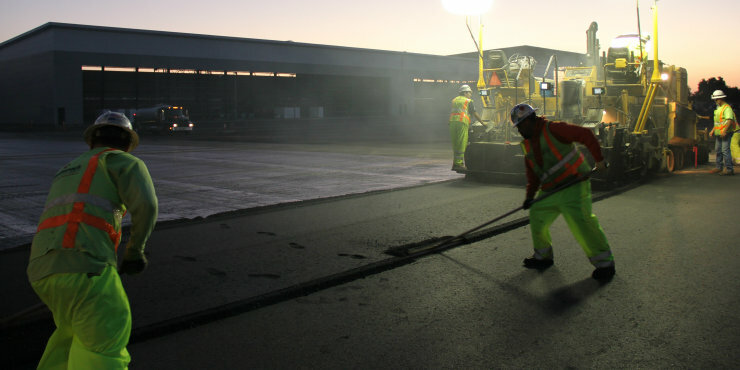 Graniterock’s paving job at Norman Y. Mineta San Jose International Airport has been one of strong productions and efficiencies. Graniterock is working with general contractor Weitz Construction of Arizona to help build a new private jet terminal. 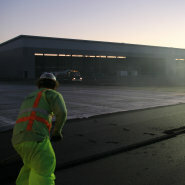 The Construction Division project calls for a total of 56,000 tons of asphalt from Graniterock’s Redwood City plant for the 900,000-square-foot apron to be used for plane parking. 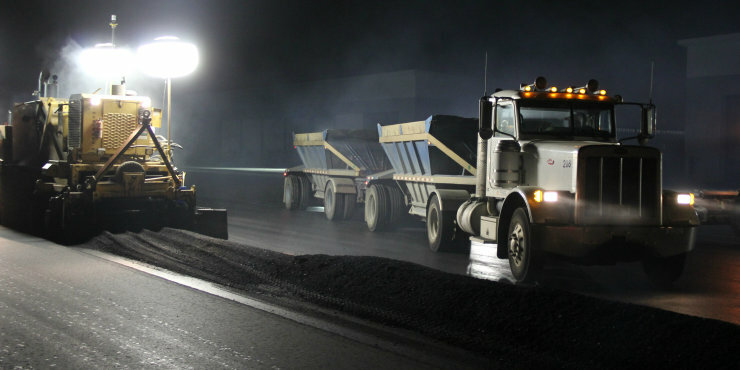 In addition to the paving crew, the plant and RTS have ensured the asphalt mix meets the FAA’s tight specs and compaction requirements. 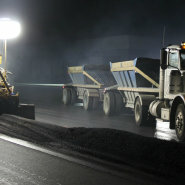 Grade setter and GPS guruJason Smythhas also played a key role in operating the 3D paving system to control the grade. The 29-acre terminal on the northwest side of the airport will feature 240,000 square feet of hangar space. Of the seven hangars constructed for Signature Flight Support, five will house Googlejets. Other Graniterock work for the new terminal includes 6,000 yards of concrete poured this pastMarch for new taxiways, sub-grading, lime treating, CTB, concrete work for all of the vertical curbs and sidewalk, base rock placement and fine grading. Graniterock is expected to wrap up its work on the Signature hangars in early October. A special thanks goes out toBobby Gill, Robbie Kashka, Brad Croft, Pedro De La Riva, Nicholas De La Torre, Robert Gutierrez, Luis Leyva, Jose Martinez, Ramiro Mercado, Gustavo Padilla, Justin Reinman, Jose Romero, Jason BauerandArthur Siqueiros Jr.